In the newest version of OpenTX, a new dialog box has been added when you try to bind a Frsky receiver to your Taranis. There are four options, “Channel 1-8 or 9-16, and Telemetry On or Off. This article will explain what these options mean. This option will appear whenever binding in D16 mode. For mini quad, 99.9% of the times you should just select “Ch1-8, Telem On“. But if you want to know what other options mean, keep reading. The options “Telem ON” and “Telem OFF” determine whether telemetry is enabled or disabled for this receiver. The way telemetry works, is because there is a small transmitter on the radio receiver to send data back to the radio transmitter. There are situations where you might want to control multiple radio receivers at the same time, for example when you use the receiver redundancy feature. We talked about receiver redundancy when we were reviewing the R-XSR. It basically allows you to connect a secondary receiver to a primary receiver, when radio signal is lost from the primary receiver, the control system could fall back to the secondary receiver. However, you can’t have both receivers sending telemetry data back at the same time, because the radio transmitter can only listen to one receiver. Therefore you have to disable telemetry for the secondary receiver in this case. 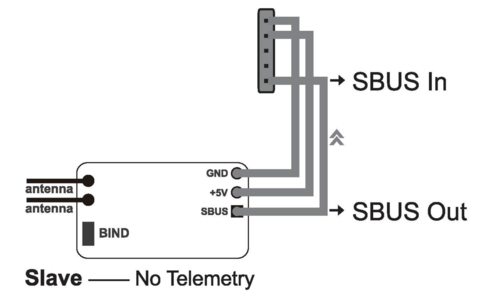 Telemetry is only enabled for the primary receiver when binding. That’s what the Telemetry On and Off options are mainly for. If you are not using the receiver redundancy feature, just bind with telemetry on regardless what receiver you use. Even though for RX’s that don’t support Telemetry such as the XM and XM+, it won’t really matter. It’s true that by setting “channel range” to 8 channels instead of 16 can reduce latency in the Frsky radio control link. But this is not how to select 8 channels. You select 8 channels under “Channel Range” in model setup. So what are “Ch1-8” and “Ch9-16”? Basically the option Ch9-16 is designed for people who use receivers that have PWM outputs for things like servos. Selecting the option “CH1-8”, maps the channel 1 to pin 1 in the receiver, and the rest of the channels to the available pins. If “Ch9-16” is selected then channel 9 is going to output on pin 1 and the rest of the channels are mapped to the available pins. For an RC plane with complex control where you might need more than 8 PWM channels, you can use 2 PWM receivers at the same time (because most PWM receivers only has 8 outputs). Use the first receiver for the first 8 channels as well as telemetry, then use a second receiver for channel 9-16 and output PWM (such as the X8R receiver) for controlling servo, camera gimbals, FPV switcher etc, without telemetry. On some receivers, RSSI comes out of Channel 16. By selecting channel 1-8 won’t affect RSSI, it will still come out of that channel. If you fly mini quad, just bind with “Channel 1-8, Telemetry On“, problem solved. if you always have ” telemetry off”, try to change internal RF “Mode off”. Its work for me. I’ve been having problems with the Frsky XM, it binds but doesn’t communicate with my FCs unless I have the TX set to D16 1-16, 1-8 will not work. Can you explain this? Odd, maybe try updating the firmware on the receiver?